The Montreal 2016 Mural Festival brought lots of new colours, textures and an artistic flair to the city’s streets this past summer. One of those pieces was a large, brightly-coloured painting of a woman gazing upwards. Her features are illuminated by the painted neon light. Found on the corner of St. Cuthbert and Clark Street, this larger-than-life mural is my new personal favourite. Created by Montreal artist Five Eight, this mural contains all the things I love about Montreal: lots of colour, a brick background and bright neon lights. The asymmetrical architecture of the building gives the mural depth and breaks up what would have otherwise been a plain, rectangular painting. 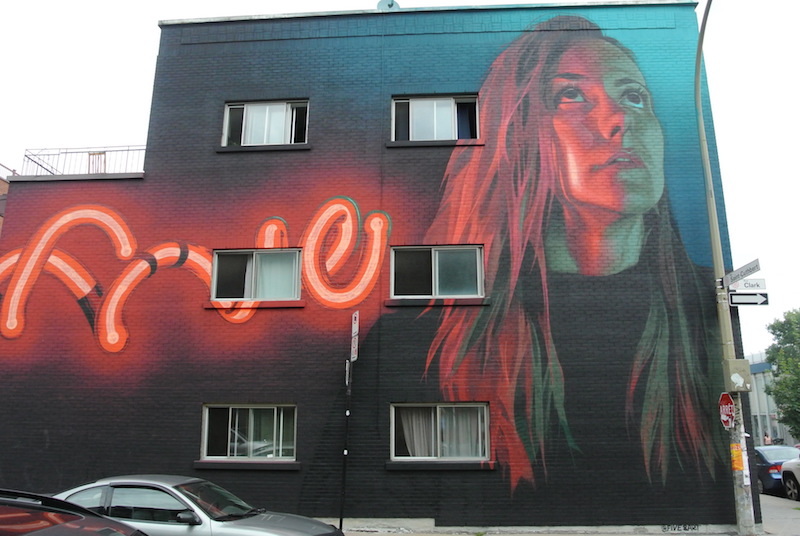 The ensuing negative space, somewhat filled by the neon elements, makes for interesting contrast to the subject’s features and hair, which take up a large portion of the mural. Five Eight is a Montreal-based artist and mural painter who, according to his Facebook page, is currently experimenting with neon signage. Five Eight’s Instagram is full of his mysterious and elusive graffiti art found all over Montreal. He is known for his work with murals, as well as on canvas. The detailing on the girl’s face is captivating to look at. The artist uses shadows and expertly-crafted shading to give the character life-like facial contours and a thoughtful expression. The mysterious blue light shining onto her face makes me wonder where she is and where she is going. Is she leaving the club that is beside her? Is she waiting to meet her friends before going out on St. Laurent? Or maybe she’s just admiring our city. Either way, this mural has a story to tell. Like so many people this past week, maybe she just arrived in Montreal and is exploring the surrounding nightlife. By having her look up at the sky, the artist makes me wonder what is going through her mind, what she might be thinking, and what inspired the artist to give her such a thoughtful expression. Five Eight is a member of the En Masse Collective, a Montreal-based, multi-artist collaborative project. His En Masse portfolio shows the work he has done work at the Under Pressure Graffiti Festival here in Montreal, as well as at Manifesto Toronto—one of the largest hip-hop festivals in the world. To check out more of his work, you can find Five Eight on Facebook or Instagram @five8art.